In 301, when St Gregory the Illuminator converted King Trdat to the faith, Armenia became the first country in the world to adopt Christianity as its state religion. The Armenian church is called Apostolic because the country had been evangelised by two of the Twelve Apostles, Thaddeus and Bartholomew. Armenians claim descent from Noah’s great-great grandson Haik, from whom their name for their country, Hayastan, derives. Armenia is symbolised by the looming snow-capped peak of Mount Ararat, where Noah’s Ark landed, now over the Turkish border. Historically often much larger in area, the Republic of Armenia which emerged out of the breakup of the Soviet Union in 1991, is about the same size as Belgium. 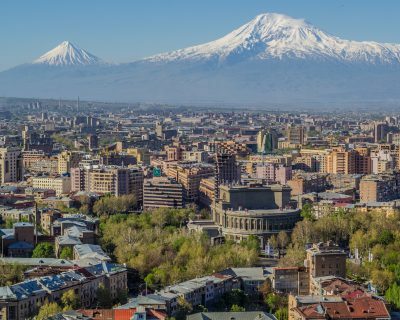 Our nine day journey begins and ends in Yerevan, the capital of Armenia, situated on the edge of the Hrazdan River.